JAKARTA (Reuters) - Supporters of the governor of Indonesia's capital are hoping their checkered shirts in red, white and blue will help galvanize the vote in a city election on Wednesday and win a second term for their leader. 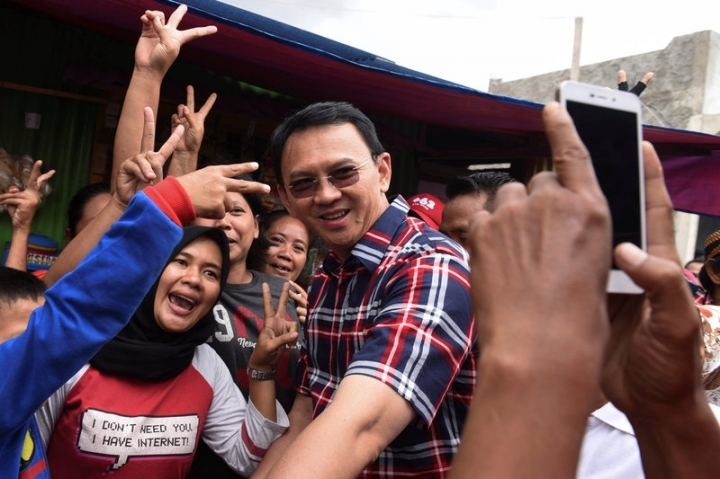 Basuki Tjahaja Purnama is Jakarta's first ethnic Chinese and Christian governor, and the election in the city of 10 million people has stoked religious tension in the Muslim-majority country. Purnama has won middle-class support for cutting red tape and improving the performance of the bureaucracy, but he has been campaigning for re-election while on trial for blasphemy, after being accused of insulting the Koran. The checkered shirts were first popularized by his predecessor as city governor, Joko Widodo, who became president of the world's third-largest democracy in 2014. The shirts are aimed at invoking a folksy charm and conjuring up a sense of hard work, and Purnama often wears one. His supporters have also taken up the fashion, turning up at his weekly court appearances where they are separated by police in colorful contrast to white-clad members of a hardline Muslim group calling for Purnama to be jailed. Purnama suffered a hit in the polls, apparently related to his trial, but his support has rebounded over the past few weeks. His campaign team is hoping the checkered shirts will resonate with voters, in much the same way that U.S President Donald Trump's "Make America Great Again" red baseball caps did. "It's simple, easily remembered and is a symbol for hard workers," said Purnama campaign official Guntur Romli. "We're invoking that memory," Romli said, referring to recollections of Widodo, a hugely popular Jakarta governor who has retained strong backing after his move to the presidential palace. 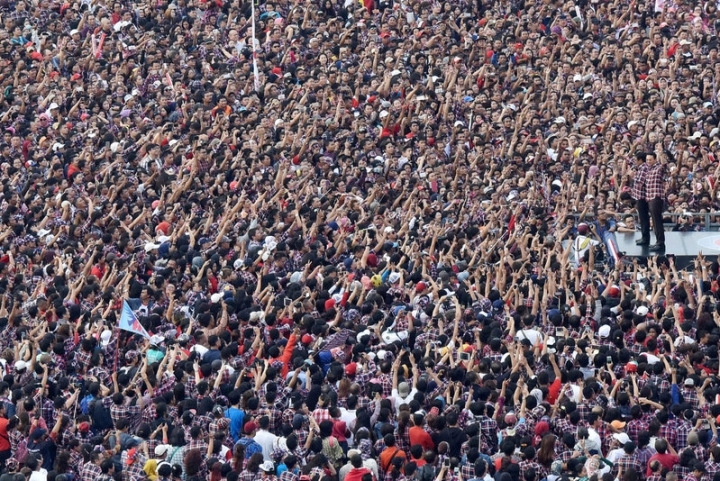 Near Purnama's campaign headquarters, the red, white and dark blue checkered shirts cost up to 170,000 rupiah ($13) and have recently been selling fast at street stalls. Hats, mugs and key chains bearing the likeness of Purnama, who is known by his nickname Ahok, were also on display. Office worker Emma Kusuma, who was browsing through the merchandise this week, said she had made the trip from the outskirts of Jakarta. "I was hoping to catch a glimpse of Ahok and take photos with him," she said. Other businesses are also trying to cash in: fast-food chains and online shopping sites have launched election promotions, including discounts for those who share the same name as candidates. Purnama, who was Widodo's deputy when he was running Jakarta, is in a tight race with Agus Yudhoyono, the son of former president Susilo Bambang Yudhoyono, and a former education minister, Anies Baswedan. Baswedan often wears a white shirt and a black Muslim cap while campaigning, while Yudhoyono tends to be more casual in a black polo shirt. But neither has established a trademark style.